Breathtaking views surround these granite crags that are just a short hike from the car. In the heat of summer, when most other inland boulders are sweltering, you can stay cool next to a tide pool and chill out, enjoying some high times after topping out these highball lines. The tide pools here are unique, with crystal clear water, round granite bowling balls, and bright colored starfish and sea anemones. 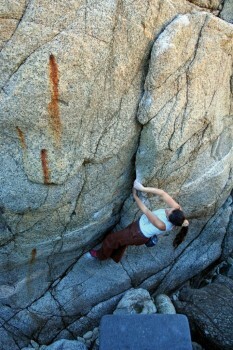 The granite is slick and polished and for anyone who has bouldered on Sierra granite it’s also a bit familiar. It can be quite peculiar laybacking a crack that feels like Yosemite and then, krrsplash, a wave crashes nearby, reminding you what a unique place you’re hanging out at. Speaking of Yosemite one of the original pioneers of climbing at Granite Creek, Barry Bates was also a pioneer in Yosemite with first ascents of classics like “Lunatic Fringe” and “Five + Dime” in the early seventies. There is some more bouldering to the north and along the coast to the south all the way into Big Sur. Local climbers have even made up there own rating system for the climbing areas from Carmel to Big Sur they call it the BS (Big Sur) system. It’s like the Yosemite Decimal System just replace 5 with BS. Of course if you don’t like the rating of the climb you’re on then the BS can stand for something else. Which SuperTopo guidebooks cover Granite Creek?